Hatton House Diaries | One day, we decided to buy a 125 year old Victorian House in Des Moines, Iowa……. Our “new” baby just turned one, so I’ve been making a push to finish the nursery. I used a Natart crib that I saved (clung to?) from my store, just waiting for this baby. 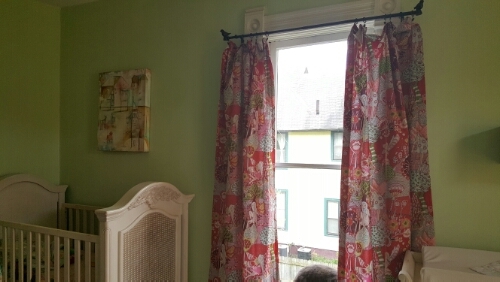 I made the curtains from Alexander Henry fabric I found at my favorite place to shop while visiting my parents, The Fabric Corner in Arlington, Massachusetts. I even hand sewed the lining (a story for another day). I met Brice McCasland at the Des Moines Art Festival and bought one of his paintings. He ran an auction on his Facebook page and I won this perfect painting for the baby’s room. 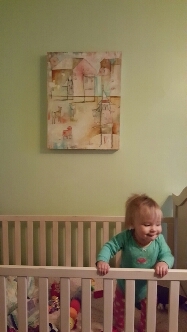 I love starting her off with fine art. More photos to come as the room gets closer to finished. Last Fall, we got a stretch of warm weather that allowed us to kick start our windows project. This is an ongoing project, given the house has roughly 50 windows all in some state of disrepair. The warm spell allowed me to complete the finishes on the windows in the kitchen addition. These seven windows were new construction, but were never painted or stained when the previous owner installed them. This is still our “work room,” so excuse the mess, but the trim turned out great, if I do say so myself. We used new wood because it seemed silly to spend on historic/old growth on a room that’s new construction. Just the same, we wanted the look to flow with the rest of the house. I used a combination of General Finishes gel stain and shellac and was able to add some pretty nice depth and color to builder basic wood. These boards are 1×4 that were routered to mimic the larger trim in the rest of the house. While I worked on these windows, my engineer husband worked out a frame that we could insert in our historic windows behind the storms so we could continue working on windows through the winter, new baby permitting. He used a mural panel from one of my previous projects, so we had a lovely cartoon view for the in-progress windows. In addition to refinishing, our historic windows get new glazing, new glass where required, new ropes, and weatherstripping. We’re excited to watch our heating bills plummet with each redone window. We bought the Hatton House specifically because it had four bedrooms, in the hopes that it would one day house a family of five. We’d just about given up hope when we found out our third kid was due in April of 2015. So sorry for the lack of recent updates, but we had a good excuse. In my life before the Hatton House, I designed children’s rooms and painted murals for children. Like the cobbler’s shoeless kids, our baby is almost one and her room is just starting to come together. Hopefully, you can look forward to more consistent posts of house projects, included one about the completed nursery, but for now, here’s our new future rehabber in her native environment. I could have worked on windows all summer long, but why would I do that when I had all the time in the world? I was caring for a new baby so I guess I have some excuse this year. Our third child turned six months old just as the weather turned cooler. I suddenly thought I needed to rush to make up for all of the time I lost in restoring our windows. 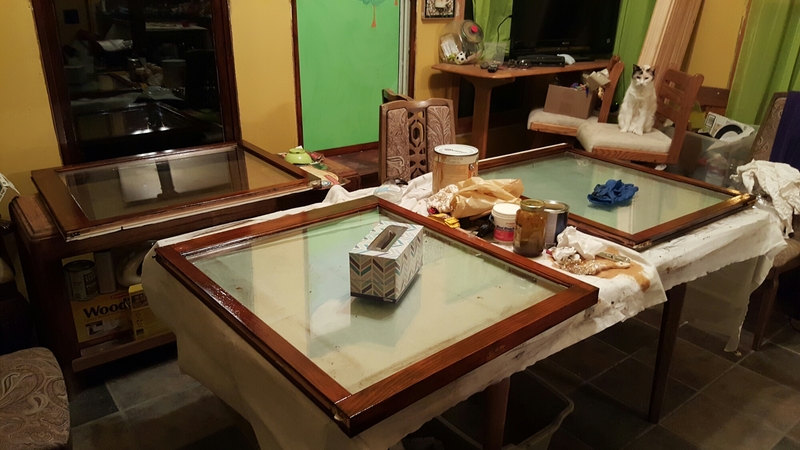 It started with finishing the windows that I had pulled a year ago, just before finding out that I was pregnant. Then I started pulling windows from our addition, a space that had new construction wood windows that had never been finished by the previous owner. Now it seems like I’m in a never ending friends eat to beat the clock and the following temperature is to finish every window in the house ( which of course is not going to happen before winter). I’ll try to post photos of my process work when I have a little more time but for now I’m happy to be back full steam in the neverending restoration.